When choosing energy efficient light fittings for your home, you often face a slew of jargons. I am going to trudge through these tech-words and tell you the things that matter. What every word and term stands for? How does it affect your light fittings? Let’s start! Watt is Lumen? -- Damn those bright lights. Watt measures energy, Lumen measures brightness. A lower wattage will help you to have a lower energy bill. A higher brightness is a result of a higher lumen. With the introduction of energy-saving lights, brightness is measured in lumens. So depending on whether you want the bright, blinding lights or soft, mellow lights -- you can make the informed choice. Around 400 Lumens is okay for a bedside table lamp. You might want to consider 1500-3000 Lumens in total (from multiple sources) for a well-sized living room. Colour Rendering Index -- To measure the accuracy of colours. Is my red, your red too? That’s what CRI comes down. It measures the ability of a light source to accurately represent various colours. Does it change say a “black and blue” dress to a “white and gold” dress? A good CRI score is above 80. However, if you are about to photograph or design something in the light space, a higher CRI score (around 90 to 100) is always preferred. Annual Cost -- What’s the cost to your pockets? Bulb fittings & shapes -- Finding the right fit. If you are about to replace your old bulb with a new energy-efficient light fitting, the fittings have to match. The shape of the light matters too because it indicates the spread of the light. A golf-bulb or a globe provides 360-degree spread. A spotlight has a narrow beam. Also, you can consider the aesthetics when choosing your energy efficient light bulb -- will it look good in a particular location? For example, you don’t want a long stick protruding on the top of your basin. Kelvin -- Show me your true colours! 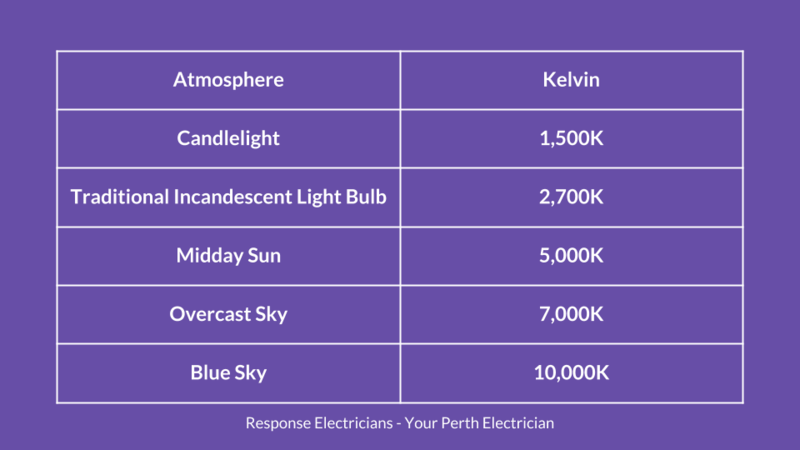 Kelvin states the colour temperature of your energy efficient lights. As you can see in the table below, the higher the value, the cooler the energy efficient light is! The lights over 5,000K tend to be white or blue and cool, whereas the lights under 3,000K tend to be yellow or red and warm. Warmer lights create a cosy ambience, you can use them in your bedrooms. Light fittings with higher value help you to stay alert and you can use them in your study room or office. I hope the above guide will help you to make a well-informed decision to choose the energy efficient light fittings for your home. 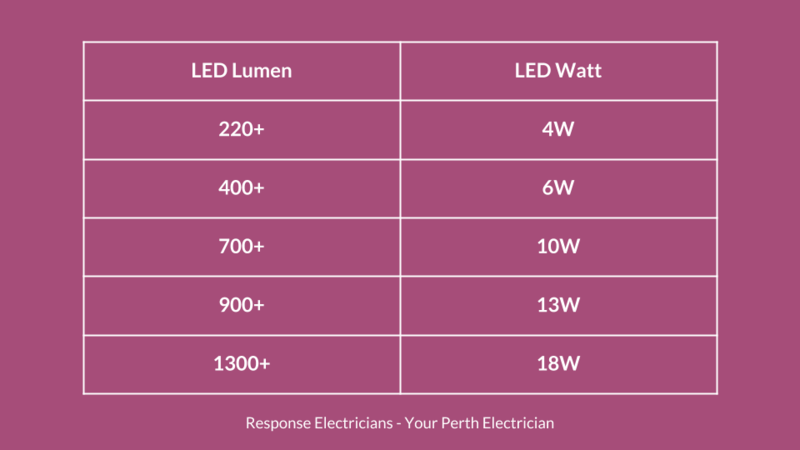 After you buy the energy saving light bulbs, if you need help to install light fittings in your Perth home, we are happy to help! Our team of reliable and friendly electricians are just a call away. Newer PostWhere to buy the correct lamps in Perth?